This edition of comic book fan casting, it’s time for me to have some fun. I am going to focus on one of my favorite books to come out of the DC’s New 52. A group of criminals from Arkham Asylum are given the chance to work off time from their sentences by taking missions that are too dangerous or controversial for the real heroes. The squad is controlled by the insertion of bombs into the back of the members necks that are controlled by their handlers. Taskforce X/ the Suicide Squad is overseen by Amanda “The Wall” Waller, the head of a government agency known as Checkmate. I would love to see Brad Bird run with this. Sure, most of his work has been on animated movies and shows. But he proved he can handle an ensemble cast really well with Mission Impossible: Ghost Protocol, and this one will really need that to make it work. The tough as nails head of Checkmate. Amanda “The Wall” Waller is a woman of strong convictions that is willing to risk any of the members of the Suicide Squad to reach her goals. I am a little biased after watching Assault on Arkham, but I would cast CCH Pounder as The Wall. She has the presence to be an imposing force to control the group of psychopaths on the team, and could be believable as the head of a branch of the government that “doesn’t exist”, and specializes in planning for the chance of a superpower threat posed by the existence of beings like Superman. The lead member of the squad on the ground, Deadshot is a deadly assassin with only his daughter to live for. He has been a part of the Suicide Squad many times and knows how the game is played. Though he hates being dragged in by Waller and has very little respect for her. Eric Bana would be really good as Floyd Lawton. He can portray the emotion of being a father just trying to make good for his daughter, and could really make the dangerous assassin side of Deadshot work. The deranged ex-psychologist and girlfriend of the Joker, Harley Quinn is a loose cannon that enjoys the mayhem she produces. She has had a fling or two with Lawton that could make for interesting character building. While I like the original Harley costume. I feel they would have to go with a cross between Harley’s pre-52 and current costumes. 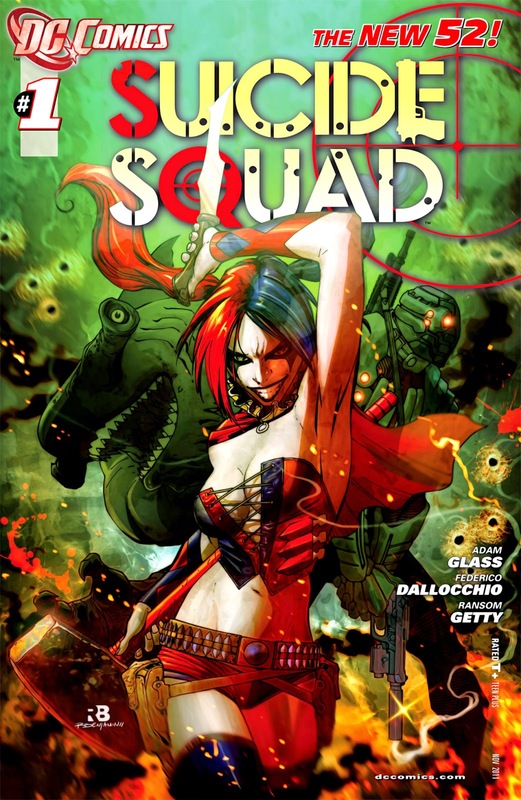 her original outfit just seems a little too unbelievable for the whole clandestine stealth that the Suicide Squad goes on. However her New 52 costume of a corset and daisy dukes is extremely impractical and a little overly sexualized. I would really like to see Karen Gillan play Harley. She showed her ability to play an emotionally unstable character with her portrayal of Nebula in Guardians of the Galaxy. But I would really like to see her take it to the next level by playing Harley Quinn. Harkness is an Australian super-villain, most notably to The Flash. He grew up in poverty, and as such taught himself to use boomerangs. He is really good with them, and uses them for evil purposes. Captain Boomerang is another member who has lots of experience with being a part of the Squad. He also has an ongoing rivalry, sometimes friendly sometimes not, with Deadshot. I think David Wenham would be a lot of fun in this role. He has the look and the attitude. Wenham could make the cheesy nature of Captain Boomerang a lot more interesting, After all Captain Boomerang is basically Green Arrow with Boomerangs. Needham is a former drug addict, who turns into a vigilante after accidentally killing his own father trying to knock over a store for money to score more drugs. He believes himself to be a force for good, but his tendency to kill puts him at odds with the true heroes. Malik Yoba is who I would like to see cast as Black Spider. He was great on the show Alphas as the member of the team with super strength. I feel could really do well with the complexities of Spider. As always. Thank you for reading my comic book casting. If you have any questions or comments on how to improve my posts, feel free to leave them in the comments section.